Notes: Ideal for the record buying trip or the shorter DJ gig. It has zip on front to expand the bag for easier access when DJing. Well made nylon bag, all double stitched for strong long life and thick bottom padding. Shoulder strap for ease of carrying. Additional pockets for accessories etc. Notes: Natural Cotton, 16x15'' with 22'' straps, 6 oz. Medium Weight, holds at least 5-6 LP's. Notes: This premium gym style bag is great for everyday use. It looks cool and funky and it can also fit 10 x 12" records for all you crate diggers and vinyl junkies! 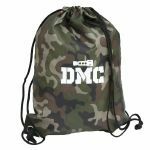 Notes: Multi-functional, retro-styled backpack from DMC which is both extremely practical, and very cool looking. 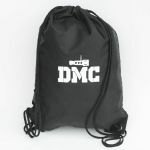 Great as the "go to" DJ bag for your vinyl, laptop, portable turntable, headphones & associated accessories but also highly suitable as an everyday backpack, carry-on luggage and lifestyle bag. Notes: Specially dedicated to all 45 enthusiasts and vinyl pros, the new MAGMA 45 RECORD-BAG 150 offers an extremely compact and stylish way to travel with up to 150 x 7-inch records. 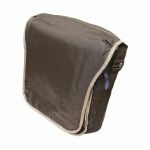 The fully padded main body features a reinforced semi-hard PVC-body, providing excellent protection and a stable fit even in the pre-selected position of the records. The main compartment is divided into two equal sections, so records can be organized front-to-back or side-to-side. Notes: The Magma LP Bag 100 Profi is another proven Magma classic. The big storage space (allows 90-100 vinyls), carefully thought out functionality and timeless design turns this bag into a completely reliable companion for the club DJ. Notes: Another proven Magma classic. The big storage space (allows 90-100 vinyls), carefully thought out functionality and timeless design turns this bag into a completely reliable companion for the club DJ. Notes: This bag which accommodates 40 records and additional accessories, is absolutely perfect for shorter DJ gigs or for the weekly record shopping trip. With the integrated and sinkable rucksack straps and a lot of small accessory pockets, the bag can also be used as a multi-functional courier bag for office or leisure time. Notes: This bag which accommodates 40 records and additional accessories, is absolutely perfect for shorter DJ gigs or for the weekly record shopping trip. With a lot of small accessory pockets, the bag can also be used as a multi-functional courier bag for office or leisure time. 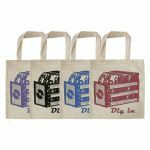 Notes: This is a smaller variant on the well-proven Profi-Bag, which accommodates up to 60 vinyls. With the sling on the back, this bag can be fixed on any Magma trolley. Notes: The smaller variant of the well-proven Profi-Bag, which accommodates up to 60 vinyls. With the new sling on the back, this bag can be fixed on any Magma trolley. This sturdy & stylish Navy shoulder bag holds up to 25 x 12 inch records. Comes with additional Mukatsuku goodies such as vintage leather embossed keyring with brass fob ,sticker and button badge ! Notes: British made hand crafted Mukatsuku Record Messenger Shoulder Bag with branded vintage leather strip and shoulder strap. Comes with additional Mukatsuku goodies such as vintage leather embossed keyring,sticker and button badge & surprise gift ! Notes: British made high quality bespoke hand crafted soft 12 inch black backpack/record bag with embossed leather branded front. This Mukatsuku bag - exclusive to Juno - holds up to 50 x 12 inch records and comes with branded leather keyring, metal button badge plus extras, padded backpack shoulder straps, separate top carrying handle, stickers,,inside zipper compartment and additional pockets for 45's/headphones etc.Please note this bag is not padded and is designed to be folded down when not in use for easy storage. Notes: British made high quality bespoke hand crafted 12 inch Navy Blue soft backpack record bag with embossed leather branded front. This Mukatsuku bag - exclusive to Juno - holds up to 50 x 12 inch records & comes with either branded leather or lazer etched metal keyring, metal button badge, padded backpack shoulder straps, (secret gift ) separate reinforced carrying handle, inside zipper compartment & additional pocket under flap for 45's etc.Please note this bag is not padded and is designed to be folded down when not in use for easy storage. Notes: British made high quality bespoke hand crafted 12 inch soft Olive backpack/record bag with embossed leather branded front. This Mukatsuku bag - exclusive to Juno - holds up to 50 x 12 inch records and comes with branded leather keyring, metal button badge, 1x Mukatsuku 12'' slipmat (nb.colour might vary from image), padded backpack shoulder straps, separate top carrying handle, stickers, inside zipper compartment and additional pockets for 45's/headphones etc. Please note this bag is not padded and is designed to be folded down when not in use for easy storage. Notes: British made high quality bespoke hand crafted 12 inch Tan backpack/record bag with embossed leather branded front. This Mukatsuku bag - exclusive to Juno - holds up to 50 x 12 inch records and comes with branded leather keyring, 1 x metal button badge, 1 x laser etched steel 45 adapter, 1 X slipmat (either 7 inch or 12 inch version-not specified )padded backpack shoulder straps, separate top carrying handle, stickers, inside zipper compartment and additional pockets for 45's/headphones etc.Please note this bag is not padded and is designed to be folded down when not in use for easy storage. This durable 7" record bag is made from high quality fabric. Holding up to 80 x 45's the Charcoal edition shoulder bag features a bold vintage black leather front patch embossed with the Mukatsuku logo. 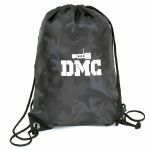 This durable 7" record bag is made from high quality polyester fabric. Holding up to 80 x 45's the olive green edition shoulder bag features a bold vintage brown leather front patch embossed with the Mukatsuku logo. Notes: British-made bespoke hand-crafted in London Mukatsuku 45 bag. This durable 7" record bag is made from high quality fabric. Holding up to 80 x 45's, the Charcoal edition shoulder bag features a bold vintage brown leather front patch embossed with the Mukatsuku logo. Other goodies included are a bespoke hand-made branded keyring in either steel or leather (that might be different to image shown), button badge and sticker. This durable 7" record bag is made from high quality Cordura fabric - known for it's durability and resistance to abrasions, tears and scuffs. Holding up to 80 x 45's the shoulder bag features a bold black vintage leather front patch embossed with the Mukatsuku logo. Notes: British made durable & bespoke Mukatsuku 45 bag hand crafted in London. Holding up to 80 x 45's the shoulder bag features a bold vintage brown leather front patch embossed with the Mukatsuku logo. Holding up to 80 x 45's the dark green edition shoulder bag features a bold vintage brown leather front patch embossed with the Mukatsuku logo. Notes: Exclusive to Juno this styllish deluxe British made vintage leather branded messenger bag in brown with shoulder strap, inside zip pocket, leather branded keyring, 12 inch slipmat (colour not specified), stickers, metal button badge, wooden 45 adapter and metal 45 adapter. Bag holds up to 25 x 12 inch records. Please note this is an individually hand made item constructed from natural materials and as such there might be a very slight variance in colour of the leather from the picture shown but this is normal. Notes: Exclusive to Juno this styllish deluxe British made vintage leather branded messenger bag in mid brown (version 2 ) with shoulder strap, inside zip pocket, leather branded keyring, 12 inch slipmat (colour not specified), stickers, metal button badge, wooden 45 adapter and metal 45 adapter. Bag holds up to 25 x 12 inch records. Notes: This hand crafted British made 7" record bag with embossed Mukatsuku logo is made from vintage soft brown leather and comes with adjustable leather shoulder strap and padded top flaps with zips to hold money, needles or adapters. This 7" record bag is made from high quality Polyester fabric. Notes: Exclusive to Juno this stylish deluxe British made vintage leather branded messenger bag in black, with shoulder strap, inside zip pocket, leather branded keyring, pair of 12 inch slipmats (1 x blue rays, 1 x olive rays), stickers, metal button badge, 1 x wooden 45 adapter and 2 x metal 45 adapters (1 x chunky spider edition, 1 x chunky laser cut flat). Bag holds up to 25 x 12 inch records. Notes: The North To South Messenger Bag is designed for the person on the go. Built with room to haul this messenger bag is wide enough to fit a heavy stack of records, a laptop, and still have room for the rest of your stuff, making it a great choice for DJs, business professionals, or really anyone who needs a sharp looking bag! Made to last and complete with a Tucker & Bloom lifetime warranty.